When you’ve got three kids who span the ages of five through fourteen, finding family entertainment to keep everyone happy is a roll of the dice. So, when we found ourselves with a rare Friday night when everyone was free, we piled in the van and headed to Mugs n Meeples, near downtown St. Catharines. If you’re like me and have no clue what a Meeple is, I can tell you that this destination is a board game lounge. 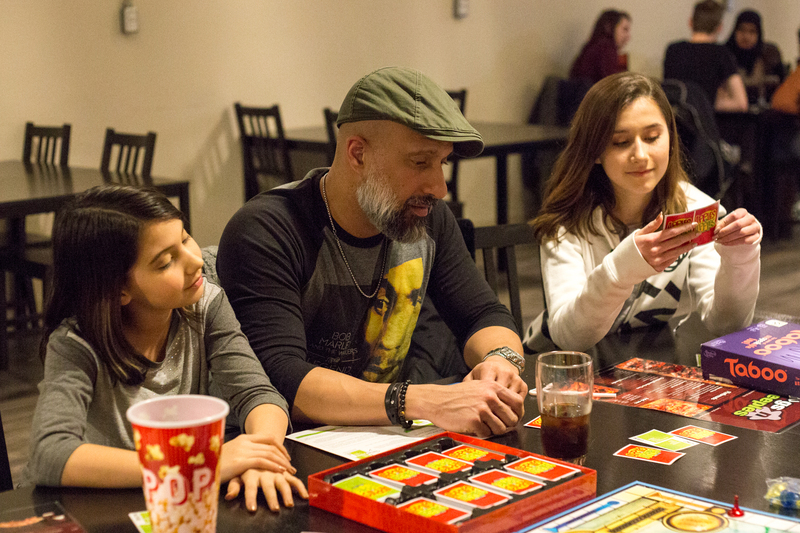 I learned that a meeple is a stylized game figure with a humanoid shape, and that a board game lounge is a no-brainer when it comes to affordable family fun that spans across generations. For under $100, we were able to have dinner (with grown up drinks – yes, they’re licensed!) for SIX PEOPLE. Plus, we got to play as long as we liked. Which of course, translates to as long as the five-year-old avoids the spiral downward into over-tired madness. 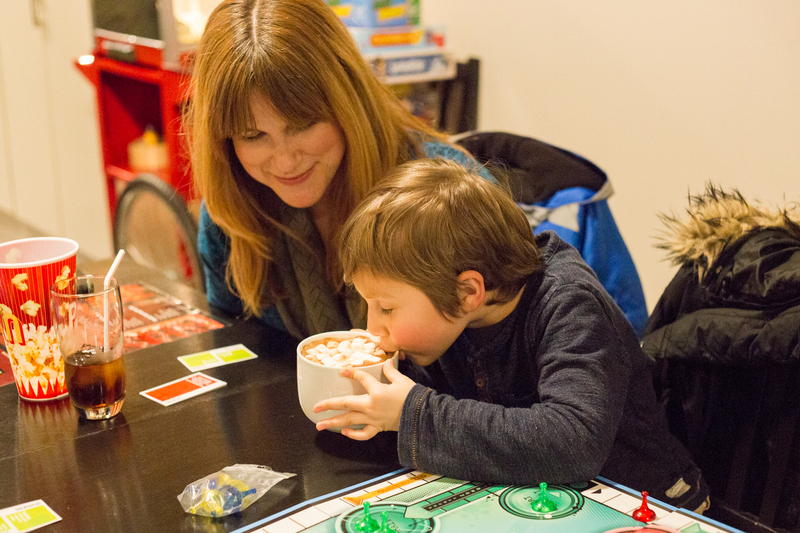 From the simple, but satisfying snack menu we chose the Family Gaming Bundle. 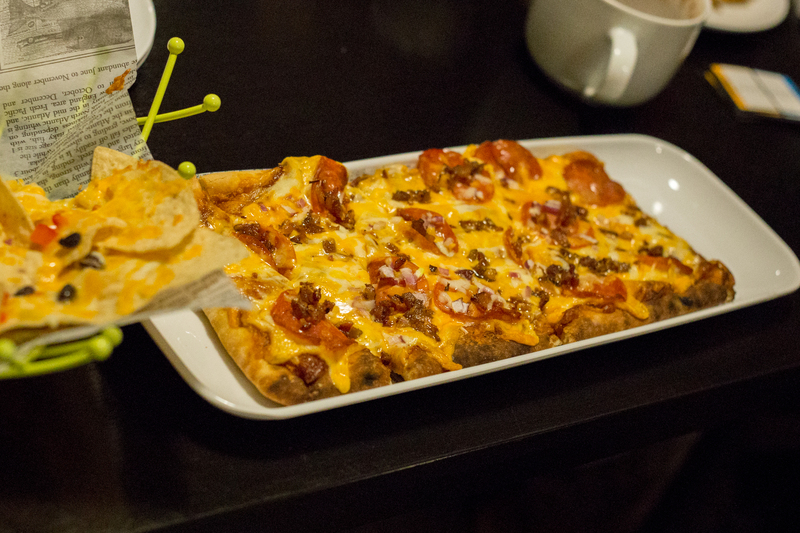 For $65 this gets you two of their flatbreads (think fancy pizza toppings on tasty flatbread), 1 giant pile of nachos, some popcorn and soft drinks plus four gaming passes for unlimited play. I won’t call this the most balanced meal we’ve ever had, but the food was fresh and tasty, and everyone enjoyed it. If you have any picky eaters in your tribe, you’ll know this was the second miracle of the evening. The kids went nuts over the flavoured hot chocolate. Um, Rollo cocoa is a thing, people! 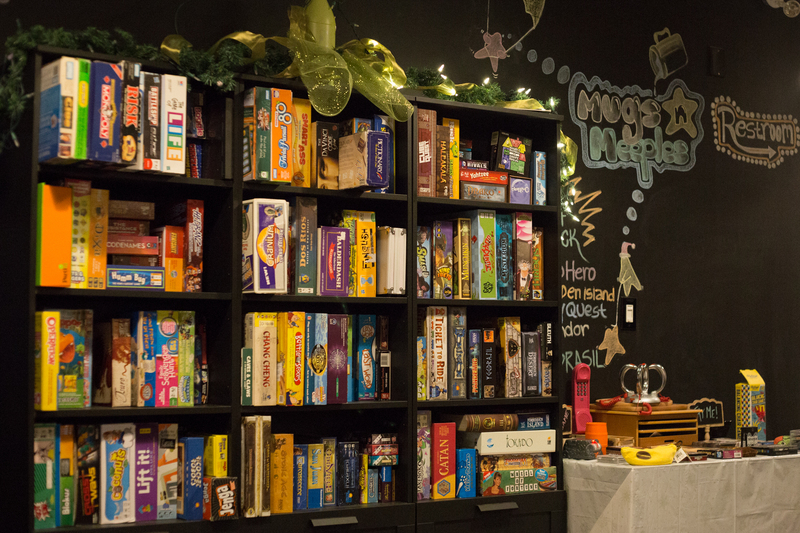 Mugs n Meeples is pristine, the music was great, and they’ve got a decent selection of board games for all ages. It was an unplugged evening where we were able to connect, enjoy so many laughs my face hurt, and there wasn’t a single argument. The owner, George, treated us like guests in his home. The service was great, he was knowledgeable about all the games and quick to offer suggestions, and clearly happy to see kids enjoying the space. Our kids were really into the classics (Connect Four, Taboo, Trival Pursuit) The other patrons were of the University set, and very excited over some elaborate strategy game. 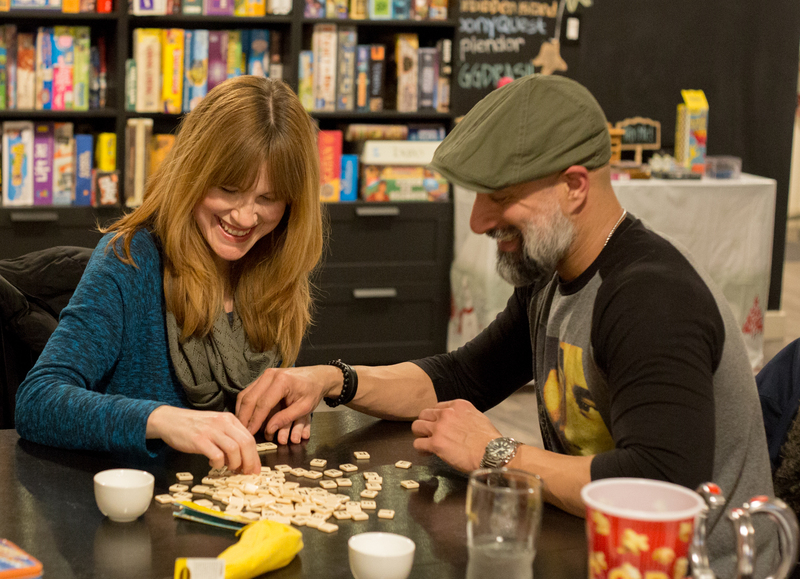 Daddy and I noted that Mugs n Meeples would also make a fabulous date night venue. George assures me the escape rooms will be opening soon, and he also let me know that they’re happy to host birthday parties. I noted that Mugs n Meeples also hosts Paint Nite evenings for ages 19+ and the next one is on March 22nd. There’s a even a coupon code ( iLoveNiagara ) for 40% off! Girls night out? We all gave Mugs n Meeples two thumbs up. 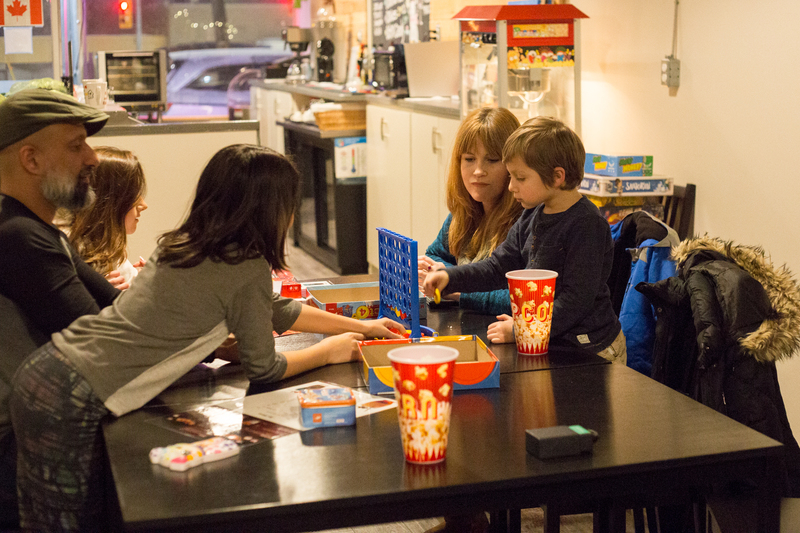 It’s a great way to bond over snacks and healthy competition, and not a single tear was shed. Maybe they’ll open a Manis n Martinis next door, and it will become the hottest family destination in the Region! Special thanks to Sarah Jamal Photography for the photos. Win tickets to Shopkins Live!